How to build a small chassis and relay system to switch the antenna from the SDR input to ground and open the speaker connection from the PC to the speakers during transmit. I use "boat anchor", i.e. separate VFO for transmitter and receiver equipment and this video is about that type of connection and is not for transceivers. Thank you to reader Mikael for writing in and letting us know that over on Aliexpress a new clone of the SDRplay RSP1 has been starting to show up. The sellers are terming it as the "MSi.SDR" in reference to that fact that it uses the Mirics MSi chips, which are the same chips used in all SDRplay SDRs. Currently the MSi.SDR is selling for about US$65 on Aliexpress. In the past we've seen other SDRplay clones but this is the first version in a dongle format, and the first time that it is actually priced cheaper than the original. SDRplay and Mirics are owned by the same people, and Mirics note that they have not distributed any chips in over 5 years, so it a mystery as to why there are suddenly a lot of unauthorized Mirics chips available on the Chinese market. It is unclear if SDRplay will be able to enforce their IP rights in China, but it seems unlikely. Mikael has provided some good photos of the PCB from the version he received which we show below. It appears to be similar to the RSP1, so it is missing the new features and filtering improvements of the newer RSP1A. When connected to a PC it shows up as an RSP1, so all compatible SDRplay software including SDRuno and HDSDR with the official SDRplay EXTIO should function with it. I have seen this sdr on various China sites for quite some time and lately on ebay as well, I was kind of sure it was a rsp1 in a new pcb layout as it claimed it to be 10khz to 2Ghz with a 10Mhz bw and 12 bit resolution and containing an msi chipset with a 0,5ppm tcxo. I ordered one two weeks ago from aliexpress for about 67$ incl postage and got it in the mail today, it was delivered with a micro usb cable and a magnetic telescope antenna with an about 2m coax cord. pluged it in and watched the device manager, as I have a rsp1a and a rsp2 I already had the drivers loaded for those, and sure, it was identified as an rsp1, so I did a quick test and and started hdsdr and and selected the extio.dll for the rsp1, it started up as it should and it behaves just as a rsp1, did a quick tunearound in the 3,5 and 7Mhz band and it was working well, have not done any in depth analys yest, will examine the pcb to see if there is any kind of filtering in there. In an upcoming post we plan to compare the various SDRplay and Airspy clones available on the market with the originals. The SDRplay team have released an updated version of a program called "rsp_tcp" (originally written by F4FHH Nicholas). This is a streaming IQ server for SDRplay devices, which is directly ported from the original rtl_tcp code that was designed for RTL-SDRs. The rsp_tcp code is fully compatible with the rtl_tcp protocol, so this should allow almost any software that accepts an rtl_tcp stream as an input to use an SDRplay device as the SDR hardware instead of an RTL-SDR. The downside to using this server is that in order to be compatible with the standard rtl_tcp protocol, the software will downgrade the RSP data stream from 14-bits to 8-bits only, thus forfeiting the RSP's greater dynamic range. However, if a custom ExtIO plugin is used on the client software, then the full 14-bits can be restored. In standard mode, the server will be compatible with any RTL server client. The team also note that they have updated their Raspberry Pi SD card to include the server. USA-Satcom is the programmer of XRIT Decoder, which is a popular (paid) Windows decoding application for GOES weather satellites. 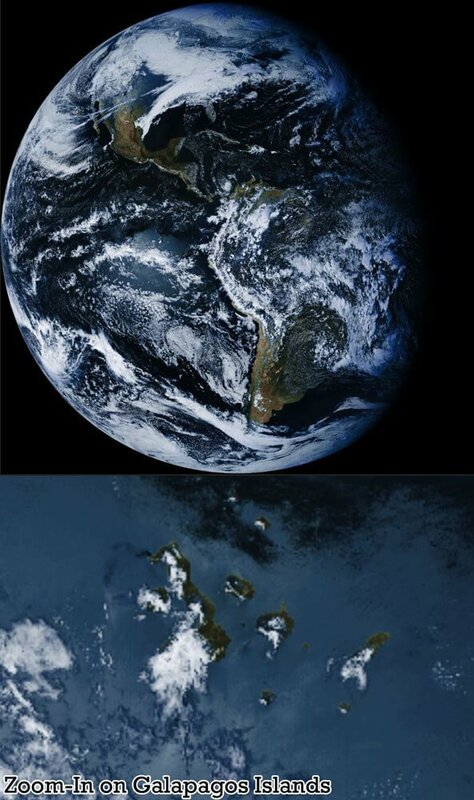 With a WiFi grid dish antenna, LNA and SDRplay, Airspy or even an RTL-SDR, high resolution full disk images of the earth can be downloaded from these geosynchronous satellites. Browse through our previous GOES posts for ideas and various tutorials about setting up a receiver. 2) An antenna Align Mode feature. 3) And a Viterbi and Eb/No (Energy per Bit to Noise Power Spectral Density Ratio akanormalized SNR) graph over time feature. 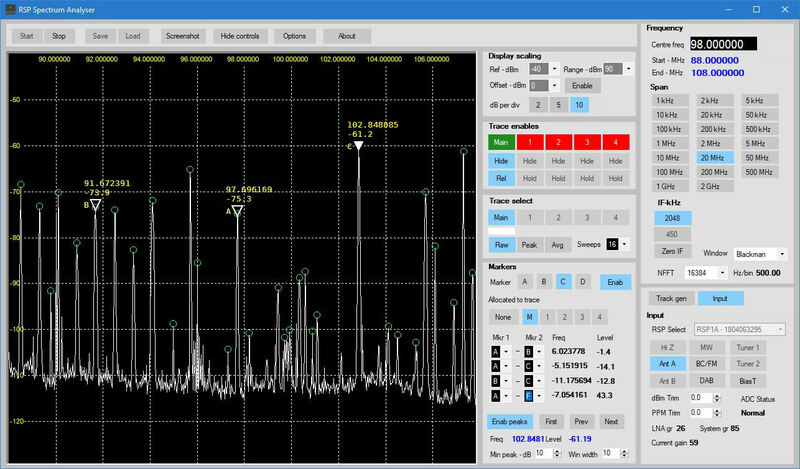 The antenna Align Mode is a great new feature that allows users to view the Signal Quality, Viterbi FEC, and Eb/No from a distance using large numeric values. This mode enables users to better view these values when fine tuning adjustments to GOES receiving antennas. The Eb/No and Viterbi graphing enables users to see how well their receiving system is doing throughout the day (e.g., over temperature and while the sun is in alignment with the receiving path). G16 CH13 & G16 Band8 Enhancements . Images received by RSP2user. See the post on the SDRplay forums for further details, higher res images and the full update history. 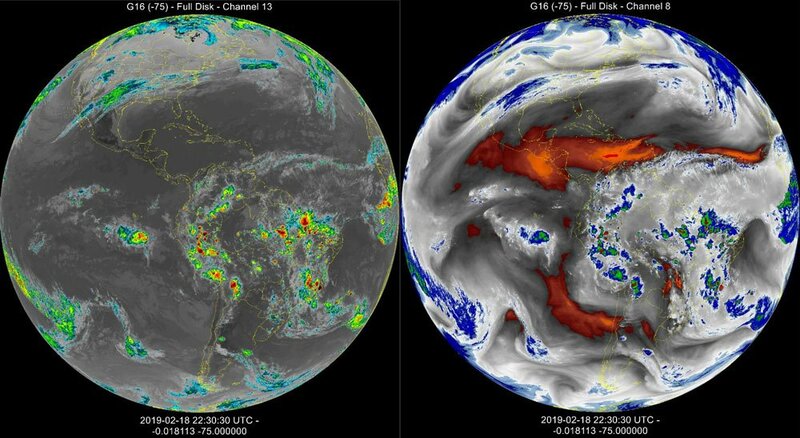 Thanks to "Lolo sdr" for submitting his videos that show his process for receiving and decoding Meteor M2 weather satellite images in Windows with an SDRplay and SDR-Console V3. Since the SDRplay is not supported by SDR#, it is not possible to use Vasilli's excellent Meteor Demodulator plugin (site in Russian, please use the Google Translate option) which is only available for SDR#. Lolo's method gets around this limitation by initially recording an IQ file of the satellite pass in SDR-Console V3, then opening that IQ file in SDR# via the Fileplayer plugin, which is also by Vasilli and available here. The process is a bit of extra work, and the image isn't live, but the image comes out clearly in the end. The videos are shown below, and subtitles are available in English, French and Italian via the YouTube player options. Recibir y decodificar Satélite Meteor M2 con SDRplay, parte 1 de 2, grabar el pase, con subtitulos. Recibir y decodificar Satélite Meteor M2 con SDRplay, parte 2 de 2, decodificar imagen y corrección.